So you went out and had a successful hunt, now you’re wondering what to do with the birds you harvested? That’s where I come in. 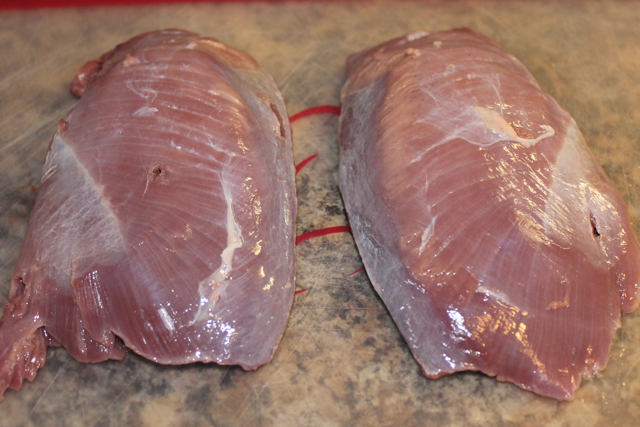 I’m here to share some of the ways I have found to make the birds we harvest into the delightful table fare they can be if properly prepare them. During this first segment, I would like to start by telling you how to prep the meat before you ever even think about putting it on the fire. When I clean a bird after harvest I usually like to take the breast meat off the bone right away since I am cleaning them at my house most of the time. Keep in mind if you are going to be transporting them, you will need to keep a wing on and the meat attached to be legal. Once the meat is removed from the bone you will have a large steak of awesomeness, covered in blood and feathers and will most likely have a few pellets in it. Needless to say, it’s not ready to throw in the fire and eat immediately if you want it to taste the best that it can. You will want to take it and rinse the blood and feathers off right away, while I’m doing this I like to take a knife and slice through the meat following any pellet holes there may be all the way to the other side to make sure the pellets passed through and are not stuck in the middle somewhere. The last thing you want to do is bite into a piece of steal while trying to enjoy your meal. You should also trim off any fat, skin, tendons, and anything else that does not look appetizing. Once the meat is cleaned put it into a large bowl or pot depending how much you have and fill it with water making sure there is no meat left exposed to the air. Put the bowl into the refrigerator and let the meat soak. I recommend a minimum of 6 hrs with a maximum of 6 days. If you are able to soak it for multiple days be sure to change the water at least once a day. Soaking it like this will remove the blood from the meat and take a lot of the “gamey” taste away. Some people recommend adding salt to the water to help remove the blood but personally, I feel that straight water does the trick. Now your harvest is properly prepped and ready to be turned into an enjoyable meal. In the coming weeks, I will be adding new recipes for you to try out at home, at camp or even in a hotel room. Keep an eye out for many recipes to come and let us know if there’s anything you would like to see.